Glenn Beck and Grover Norquist: NRA board election could lead Beck to quit over Muslim Brotherhood fears. 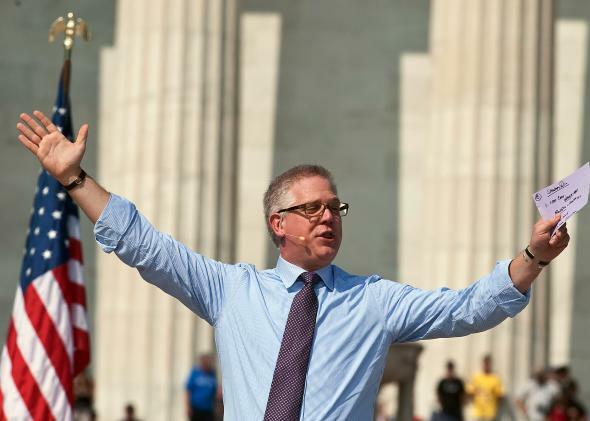 No Muslim Brother: radio host Glenn Beck at a rally in Washington, D.C., in August 2010. Glenn Beck is threatening to leave the NRA for reasons that are a bit curious. This week on his radio show—which has millions of listeners—the host talked about Americans for Tax Reform President Grover Norquist and his purported ties to the Muslim Brotherhood (to be clear, ties that do not actually exist). Beck’s guest was Center for Security Policy President Frank Gaffney, who has long held that Norquist is an agent of creeping Shariah who has insidiously infiltrated the conservative movement and managed to get the sheeple/pro-Shariah media to cover for him, thanks to his miraculously great media relations. The whole thing is goofy, but Beck seems to buy it. “I am that concerned that he is a very bad influence and a very bad man, that if this is who the NRA decides to put on their board of directors, I don’t think I can be associated with them,” Beck added. NRA lifetime members vote for members of the board, according to MSNBC. It’s unclear whether the noise about Norquist’s supposed Shariah ties will have any impact on his re-election prospects, but a handful of conservative media outlets have run credulous stories about the conspiracy theory, including the Washington Free Beacon and Breitbart News. This particular allegation has a long and wacky history in Washington. And though it’s been long debunked, some on the conservative fringe hold fast to the conviction that Norquist is an “agent of influence” propelling America into the arms of radical jihadists. That is not a thing that is happening, but it hasn’t made the true believers any less noisy with their allegations.